Why Tec Dive ? Sometimes there is not enough NDL time when you’re navigating an interesting and intriguing wreck. Some wrecks or walls with specific artifacts or life are beyond 40 metres the recreational depth limit. 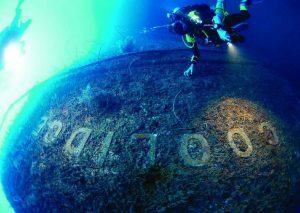 With diving attractions like Truk Lagoon, Bikini Atoll, The Coolidge and other much visited historical wreck sites, the desire to go deeper and longer has necessitated the refinement of equipment, training and skills to descend upon these undersea wartime monuments. When there’s just a few minutes to survey and take ‘snaps’ of something profoundly interesting at 35-40 metres and you really want so much more time …. Technical decompression [or CCR] dives are the next step. Sure some of us have done a few short minutes of decompression due to overstaying at depth on a single tank and had the air reserve to accommodate or a buddy nearby just in case. 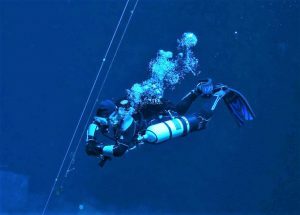 Decompression time can “rack up” pretty quick beyond 40 metres and air consumption increases such that safely diving at these depths requires multiple tanks and a run-time to perform the specific tasks and mission of the planned dive. My dive trips to The Coolidge and Truk have been spectacular and most rewarding. With the right equipment and training these amazing dive sites take on a whole new level of enjoyment when you venture deeper to visit history never before seen. Tec diving isn’t for everyone, [nor should it be the goal of every diver], however if your’e the kind of diver that likes to push the boundaries of recreational limits and you want more out of diving than single tanks can deliver, there’s another world of diving waiting. See more, dive beyond, join the exciting world of Tec diving.